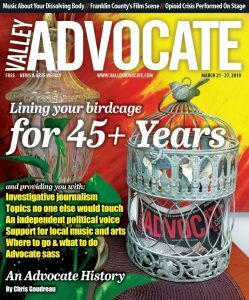 The Valley Advocate first issue, "Vol. I / No.1 / Through September 19, 1973". Astute readers will no doubt observe the “plus” sign after the number 45 on this week’s cover. That is us coming clean that, no, this is not exactly our 45th anniversary issue. 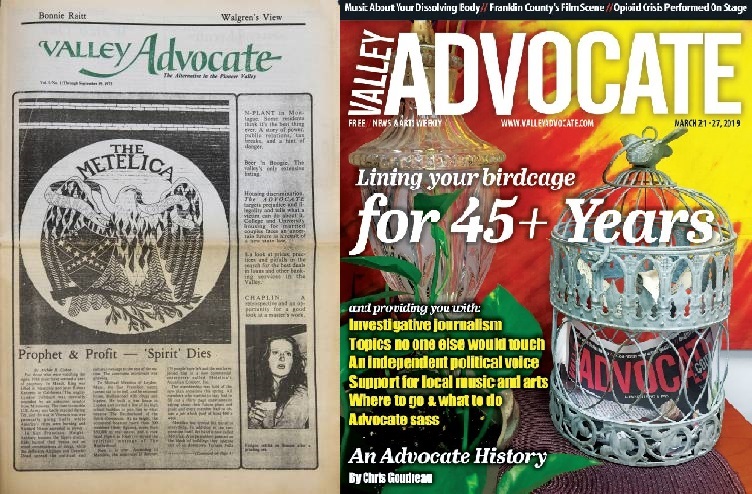 We wanted to bring you something like Chris Goudreau’s vast history of the Advocate found in this week’s edition, but in September of last year on the Advocate’s actual 45th anniversary. Unfortunately, that date was about two months after a major unraveling of many of the Advocate’s resources that made the completion of such a story both too difficult and too heartbreaking to manage. Earlier, the Advocate had been bumped down to being published every two weeks rather than weekly. Some dedicated Advocate staff members were being absorbed into the Daily Hampshire Gazette, owned by the same company. Then in late summer, the publisher at the time decided to reassign me to a swing editor position within the Gazette as a part of further shifting resources away from the Advocate. At nearly the same time, Gina Beavers, the Advocate’s arts and culture editor, accepted a position at another company. 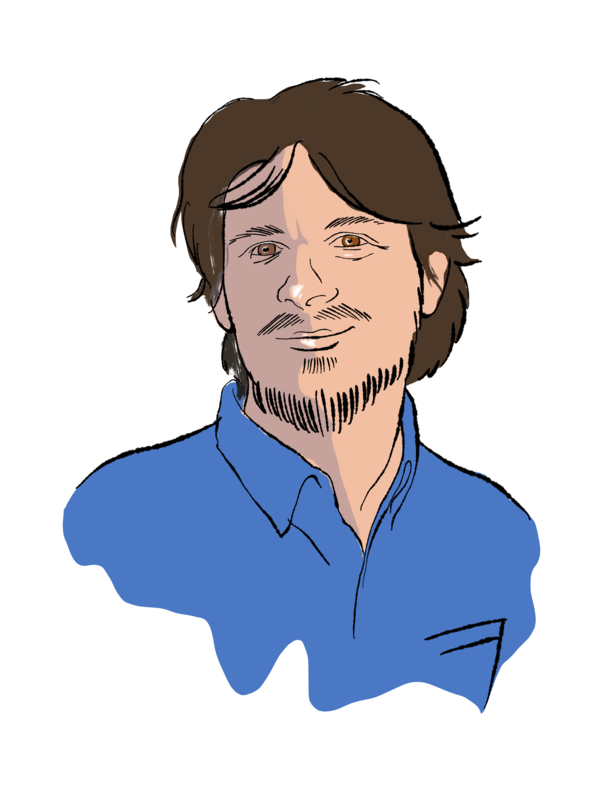 Advocate staff writer Chris Goudreau was nearly laid off before being rehired as the Gazette’s arts writer. 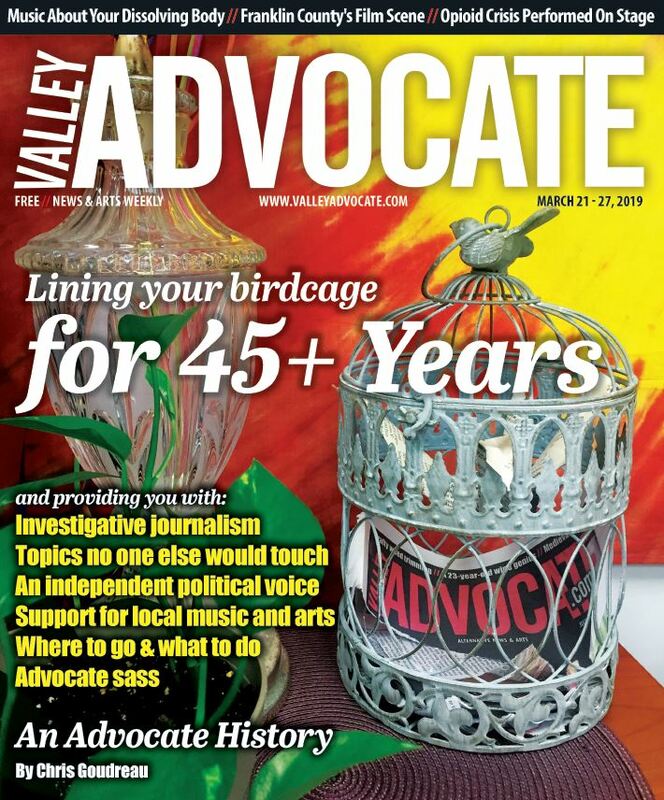 Among his tasks was essentially keeping the Advocate running without any dedicated editorial staff members, and as a strictly arts and entertainment paper without any news or commentary — formerly the Advocate’s staples over its decades of existence in the Valley. It wasn’t hard to predict that the final nail in the Advocate’s coffin was coming soon. But then the unexpected happened. Over the course of a successful unionization effort of the Gazette staff and what remained of the Advocate’s, new leadership was established in the publisher’s office. The new leaders of the papers, Aaron Julien, president of Gazette and Advocate parent company Newspapers of New England, and newly hired Vice President of Sales and Marketing Michael Moses, decided to breathe new life into the Advocate. I was reinstated as the Advocate’s editor. Goudreau got a promotion, and is now the Advocate’s associate editor. Colleen McGrath returned as the Advocate’s sales manager. The Advocate itself has returned to weekly publication, and news has rejoined arts inside its pages. We all thought it would be fitting to finally provide readers with that history we had intended to write months ago. And for both Goudreau and me, as we settle back into our editorial roles, it was important to pay respect to those who did this work before us. Also, for our own benefit, we asked their advice for how to steer the Advocate ship going forward. This is not an easy time for journalism or newspapers in general, especially those in the Advocate’s alternative mold. 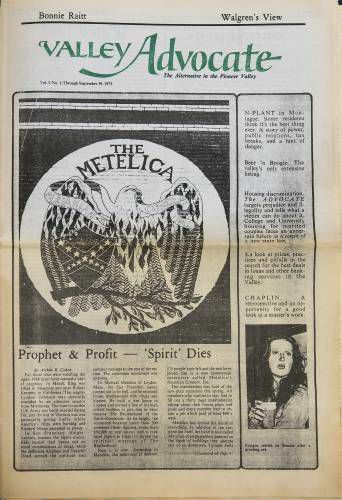 The Boston Phoenix folded in 2013. The Village Voice — a New York City icon — followed suit last year. The Advocate’s sister papers in Connecticut are no longer in print. At the same time, it is vital that the investigations and ethos of the alternative press, which gives space to stories ignored or overlooked by mainstream outlets, lives on. We’re swimming against the tide. We know that. But in many ways, the Advocate has thrived on just that sort of counter current. Its independence and uniqueness are the things that have drawn generations of Advocate-lovers to our pages, and more recently, our website and social media accounts. We are committed to helping the Advocate buck the trend and continue the alt tradition of bringing you important stories you won’t find anywhere else.